The same processes used to buy fighter jets does not work to buy technology systems. This certification empowers acquisition mavericks to employ the need for speed when buying digital services. Colloquially called the “Top Gun for Acquisition” training, holders of the Digital Service certification will be implementing the best acquisition strategies to drive high quality results. We are creating a community of passionate acquisition professionals who geek on technology and care about keeping up with best practices. We built FAC-C-DS from the ground up, with proven concepts, delivered incrementally, improved upon, and given the chance to scale. This demonstrates how USDS’s methods combined with OFPP collaboration can continually move the government forward. 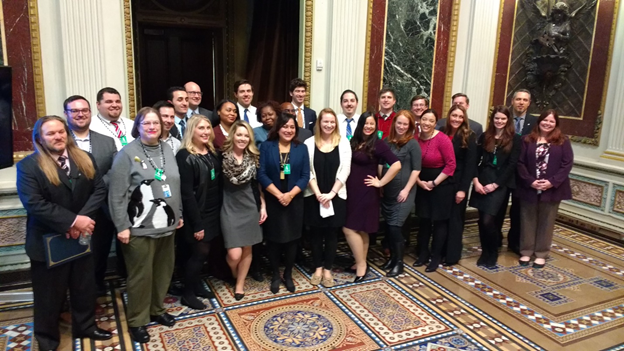 DITAP’s second cohort graduates in a ceremony held in the Eisenhower Executive Office Building at the White House. To date, we have trained 54 contracting professionals. Several graduates of the program have worked directly with U.S. Digital Service agency teams and 18F to execute contracts. Their accomplishments include: code challenges, blanket purchase agreements which foster a culture around delivery of working products, user centered design challenges, training's and consultations with agency leadership around the adoption of digital service techniques such as user centered design and agile software development. Starting in 2022 all digital service purchases over $7 million will require the focused expertise of a contracting officer specialized in digital service acquisition. This specialized workforce aligns with the President’s Management Agenda on all three fronts. By empowering the workforce of the 21st century with the best methods to acquire modern technology, we provide the tools to deliver data, accountability, and transparency. This brings visibly better results and greater efficiency across the entire federal government. How Can You Get A Certificate in Digital Service? ICF, an approved DITAP training provider, will offer the first course. Registration runs from June 18–29, 2018. Participants stay in their job, but devote about 12 hours per week for about 6 months. More information will be provided through the TechFARHub. Traci Walker is the Director of Digital Service Procurement with the United States Digital Service. Joanie Newhart is the Associate Administrator for Acquisition Workforce at the Office of Federal Procurement Policy. We’re looking for the most tenacious designers, software engineers, product managers, and more, who are committed to untangling, rewiring and redesigning critical government services. You’ll join a team of the most talented technologists from across the private sector and government. If you have questions regarding employment with the U.S. Digital Service, please contact us at usds@omb.eop.gov and visit usds.gov/join.